A new feature has been released on your favorite app for stopping smoking. This feature is called “Toxic Substances” and allows you to view the main toxic substances in a cigarette. 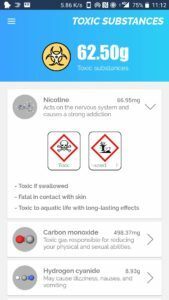 In the app you can see the dangers of each substance and the amount you have not smoked. It’s visible the nicotine or carbon monoxide but also the butadiene. You can also see hydrogen cyanide or Benzene or Styrene. We recently add ethanal and acrolein. At the same time we put ,ormaldehyde, acetone, and nitrogen oxide. We work a lot for this feature after an other who give you the oportunity to save your quit smoking datas in the cloud. You can see if the substance is explosive or flammable but also oxidizing and compressed Gas. We add in Qwit app the corrosive, toxic and harmful. Finally, we add at the same time health hazard and environmental hazard. It’s possible to see what the substances may cause in your body. For example, repeated exposure may cause skin dryness or cracking, unstable explosive, extremely flammable gas, extremely flammable liquid and vapour. Highly flammable liquid and vapour, flammable liquid and vapour, may cause or intensify fire, oxidizer, toxic if swallowed, may be fatal if swallowed and enters airways. Fatal in contact with skin, toxic in contact with skin, causes severe skin burns and eye damage. Please stop or reduce smoking because it causes skin irritation and may cause an allergic skin reaction or causes serious eye irritation. There are substances who are fatal and toxic if inhaled. There are toxic substances harmful if inhaled and may cause respiratory irritation. A lot of toxic substances who may cause drowsiness or dizziness and genetic defects. May cause cancer, suspected of causing cancer, may damage fertility or the unborn child. Suspected of damaging the unborn child or causes damage to organs through prolonged or repeated exposure and very toxic to aquatic life or very toxic to aquatic life with long-lasting effects. Toxic to aquatic life with long-lasting effects, acts on the nervous system. You know than the nicotine you ingurgite when you are smoking causes a strong addiction. There are substances who have toxic gas responsible for reducing your physical and sexual abilities. May cause dizziness, nausea, and vomiting. Smoking may causes nausea and dizziness. Possible to drunkenness and coordination problems. Cigarettes substances causes an increase in cancers of the nasal cavity and larynx. Quit smoking because it causes eye irritation, nasal irritation. A lot of problem you know like significant respiratory depression. You want more? It decreased lung function and bronchial hyperreactivity. Substances in tobacco causes skin and eye irritation, allergies. It cause eczema, breathing difficulties and cancer. Smoking a packet of cigarette may cause headache or nausea. Smoking a rolled cigarette may cause dizziness or drowsiness. Possible to have confusion or irritates the respiratory system. If you want to download Qwit, click in this link! A little message of the time : in Qwit you can write messages that will give you motivation during difficult times. If you want to know more about this app, check here. We are open to the community so contact us if you want to help.